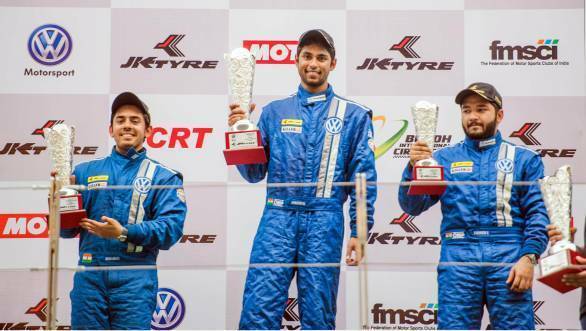 In what was an action-packed first race at Round 3 of the Volkswagen Vento Cup, Hyderabad lad Anindith Reddy clinched victory, while Ishaan Dodhiwala and Karminder Singh were placed second and third. The race started with a red flag after the first lap due to an incident that caused car number 3 to retire with a broken suspension component. Reddy, who was the pole sitter, managed to hold onto his position when the seven-lap race restarted. Once the safety car pulled out, Reddy was still comfortably placed at the head of the pack. The fight for the second position was between Karminder and Ishaan. Both the drivers were going flat out, and, at one point, it looked as if Ishaan would be overtaken. However some diligent driving by Ishaan ensured that Karminder would have to be content with third position. Inaugural Polo Cup winner, Sailesh Bolisetti, managed to fend off charges by Prabhanj Parchuri and Raghav Sharma to hold on to fourth position. Special mention though must be made of karting champion Nayan Chatterjee who was a guest driver and drove valiantly in his maiden Vento Cup appearance to finish 10th. After the race, Karminder said that this was the first time that he hadn't asked the race manager about the championship standings, because he was confident enough that he was still in contention for the title. Reddy was exuberant after having set the fastest lap of the day at 2:30.815 minutes. 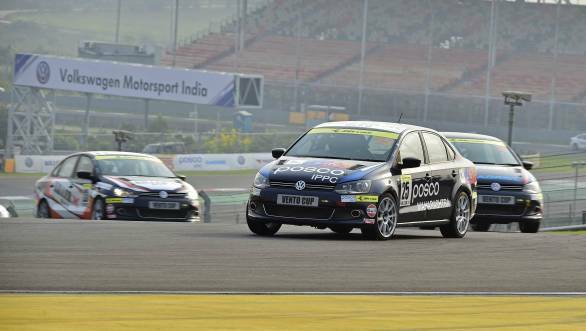 Race two of Round 3 will be held tomorrow, after which the Vento Cup will once again visit the BIC in November for the fourth and final round.